It's easy to forget that my sister and I were once little together. There was a short window of time where we enjoyed playing dress-up, watching cartoons, and playing with Barbies together. Then Janell was a teenager and I was still little. She was off doing semi-grownup things while I was still playing dress-up. I became used to "no, you're too little". The best part of growing up is that it makes those age differences that seemed so huge as kids, very minuscule to adults. Eventually I was no longer too little to tag along and Janell and I started hanging out together again. Over the years our relationship has been like a roller coaster. We are distant; we are close. But we are always sisters. Nothing can change that. Saturday, Chris and I had the chance to sit down to dinner with Janell. It was a rare treat to just sit and be with her and only her. As I sat there and listened to her talk about her adventures in teaching, I couldn't help but be a bit proud. It's nice to see her come into her own. 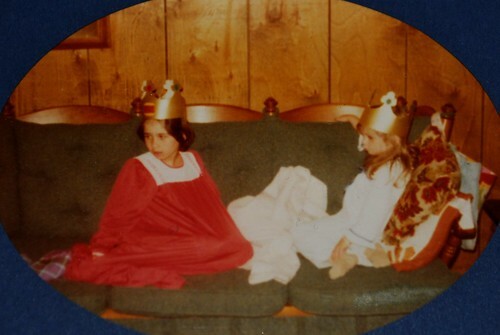 Even though sometimes I still see us as the two little girls in nightgowns wearing Burger King crowns.